The growth and degradation of the oxide scale on modified 9Cr–1Mo ferritic steel was studied at 1123 K using a thermogravimetric balance by employing the “transient-mass-gain method” in conjunction with the adaptation of a cyclic-oxidation procedure. The total duration of the oxidation was 1000 h. The experiment revealed that the cracking of the scale was initiated when the average thickness was 72 μm. Spallation occurred when the average thickness was 75 μm. The rate of spallation was found to be enhanced as the scale thickens and attained a higher rate after 90 μm. 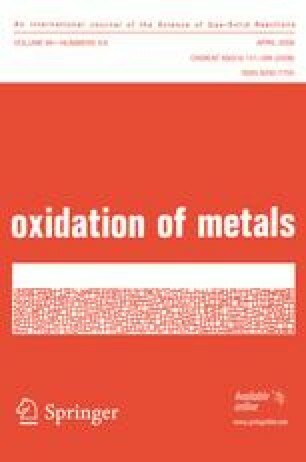 The rate constants for the different stages of oxidation were found to be different. The specimen was examined by SEM, EDS and XRD. The scale morphology revealed outwardly protruded growth, a uniform adherent oxide layer and a spalled region. Four oxide phases were identified; Cr2O3, Fe2O3, (FeCr)2O3 and FeCr2O4. The spall contained more (FeCr)2O3 whereas the adherent scale was more FeCr2O4. The authors wish to acknowledge the help rendered by Mrs. M. Radhika, Physical Metallurgy Section, Materials Characterization Group, in SEM and EDS analyses and Mrs. S. Kalavathy, Materials Science Division in the XRD characterization.